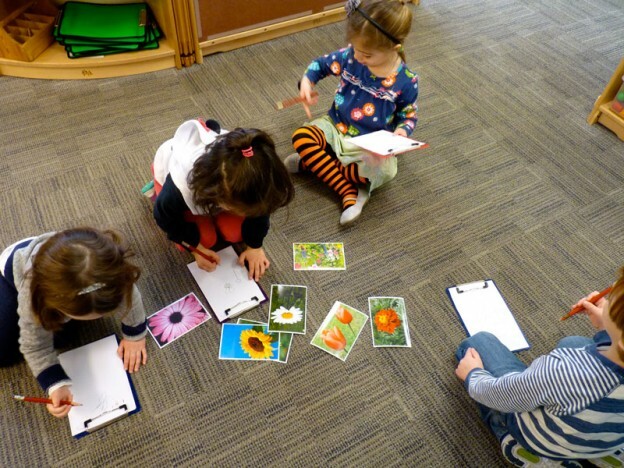 Many children in the chickadee class are in the beginning stages of representational drawing and we teachers are interested in finding ways to encourage their growing confidence in putting their ideas on paper. We decided to offer a project where representational drawings could help us plan. We know that the chickadees are all anticipating spring, bright colors, outdoor activities, and gardens. We remembered that they have expressed an interest in a sewing project along with other collaborative projects. We asked the children, “Could we draw some flowers for a garden and then sew them in beautiful colors”? Many were interested, and we formed a small group (4 children) to begin. Others came over later. We looked at photos of flowers together, thinking about how they grow, the shapes we could see in the flower heads, parts of plants and flowers, gardens, etc. Then each child drew something important to them. We’ll continue the process until everyone has had a turn to join if they choose, and then we’ll begin to plan our garden! This entry was posted in Chickadees, Curriculum, Education, Project and tagged chickadee, curriculum, education, preschool, project on April 4, 2015 by Katrina Selawsky.